Gee's golden langur (Trachypithecus geei), or simply the golden langur, is an Old World monkey found in a small region of western Assam, India and in the neighboring foothills of the Black Mountains of Bhutan. It is one of the most endangered primate species of India. Long considered sacred by many Himalayan people, the golden langur was first brought to the attention of the western world by the naturalist E. P. Gee in the 1950s. In a part of Bhutan, it has hybridised with the capped langur T. pileatus. The earliest record of the golden langur is in Pemberton's 1838 paper which states that "Griffith observed these monkeys near Tongso in Central Bhutan." However, Pemberton's work was lost and not rediscovered until the 1970s, the scientific discovery of the golden langur unfolded differently. In 1907, E. O. Shebbeare—who was out with some hunters and forest rangers—reported seeing a "cream coloured langur" in the vicinity of the Jamduar. [nb 1] However, neither a photograph nor a live or dead specimen was presented at that time. The first reference to the golden langur in print, as an animal of unidentified taxonomic status, was in a 1919 publication that stated: "Pithecus sp? – A pale yellow coloured langur is common in the adjoining district of Goalpara (Assam). Jerdon reported one from Terai, the adjacent district on the (west) side, which Blanford suggested might be P. entellus." At around the time of India's independence in 1947 a number of other sightings were reported. In February 1947, in the Forest Rest House visitor's book in Raimona, a few miles south of Jamduar, C. G. Baron reported seeing some langurs whose "whole body and tail is one colour – a light silvery-gold, somewhat like the hair of a blonde." A year later, back in Jamduar, H. E. Tyndale, a tea planter, reported seeing "Sankosh cream langurs." However, it wasn't until a few years later that a focused effort to identify the golden langur was mounted by E. P. Gee, who traveled to Jamduar in November 1953. 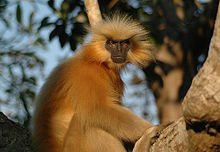 His team were able to observe three groups of golden langurs, all on the east bank of the Sankosh river. The first group was observed on the Bhutan side of the border; the second group, a large one of 30 to 40 individuals, a mile north of Jamduar on the Indian side; and a third group four to five miles (6.44 km to 8.05 km) south near Raimona. Colour movies of the second group were made by Gee. The coat of the adult golden langur ranges from cream to golden; on its flanks and chest the hairs are darker and often rust coloured; the coats of the juveniles and females are lighter, silvery white to light buff. The golden langur has a black face and a very long tail measuring up to 50 cm (19.69 in) in length. Map showing the two disconnected regions of distribution (within red rectangles) of the Golden Langur in Assam-Bhutan and Tripura. For the most part, the langur is confined to high trees where its long tail serves as a balancer when it leaps across branches. During the rainy season it obtains water from dew and rain drenched leaves. Its diet is herbivorous, consisting of ripe and unripe fruits, mature and young leaves, seeds, buds and flowers. It generally lives in troops of about 8 (but sometimes up to 50) with several females to each adult male. The smallest golden langur troop was composed of four individuals, while the largest had 22, giving an average value of 8.2 individuals per troop. The adult gender ratio was 2.3 females to every male, although the majority of groups had only one adult male. In 1988, two captive groups of golden langurs were released into two protected areas of the western region of the state of Tripura, India. As of 2000, one of these groups, consisting of six (and possibly eight) individuals in the Sepahijala Wildlife Sanctuary, had survived. Gee's golden langur is currently endangered; a total Indian population in 2001 of 1064 individuals, in 130 groups, was recorded. Of these, approximately 60% were adults indicating a relative lack of infants and juveniles. The relative death of infants and juveniles indicate a declining population with the habitat being degraded by human activity. A fragmented but protected population in a rubber plantation in the Nayakgaon, Kokrajhar, district of Assam increased in population from 38 individuals in 1997 to 52 in 2002. The population has also adapted to feeding on dry rubber seeds. It is also found in the Kakoijana reserved forest. ^ The new name, Presbystis geei, came to be inadvertently included in Gee's 1955 short note which was published two months before Khajuria's 1956 paper proposing the name. ^ a b c Groves, C.P. (2005). Wilson, D.E. ; Reeder, D.M. (eds.). Mammal Species of the World: A Taxonomic and Geographic Reference (3rd ed.). Baltimore: Johns Hopkins University Press. p. 176. ISBN 0-801-88221-4. OCLC 62265494. ^ Das, J.; Medhi, R. & Molur, S. (2008). "Trachypithecus geei". The IUCN Red List of Threatened Species. 2008: e.T22037A9348940. doi:10.2305/IUCN.UK.2008.RLTS.T22037A9348940.en. ^ a b c Srivastava et al. 2001, pp. 15–23. ^ a b c Gee 1961. ^ a b Choudhury 2008. ^ Inglis et al. 1919. ^ a b c d Gee 1961, pp. 1-4. ^ Prater 1971, p. 42. ^ Srivastava et al. 2001, p. 15. ^ Wangchuk, Inouye & Hare 2008. ^ Srivastava et al. 2001, p. 18. ^ Medhi et al. 2004. Choudhury, A. U. (1988a). "Priority ratings for conservation of Indian primates". Oryx. 22 (2): 89–94. doi:10.1017/S0030605300027551. Choudhury, A. U. (1988b). "Conservation in Manas Tiger Reserve". Tigerpaper. 15 (2): 23–27. Choudhury, A. U. (1990). "Primates in Bhutan". Oryx. 24 (3): 125. doi:10.1017/S0030605300033834. Choudhury, A. U. (2002). "S.O.S. Golden langur". The Rhino Found. NE India Newsletter. 4: 24–25. Choudhury, A. U. (2008). "Primates of Bhutan and observations of hybrid langurs". Primate Conservation. 23: 65–73. doi:10.1896/052.023.0107. Gee, E. P. (1955). "A new species of langur in Assam". Journal of the Bombay Natural History Society. 53 (2): 252–254. Gee, E. P. (1961). "The distribution and feeding habit of the golden langur, Presbytis geei Gee (Khajuria, 1956)". Journal of the Bombay Natural History Society. 58 (1): 1–12. Gupta, A.; Chivers, D. J. (2000). "Feeding ecology and conservation of golden langur Trachypithecus geei Khajuria in Tripura, Northeast India". Journal of the Bombay Natural History Society. 97 (3): 349–362. Inglis, C. M.; Travers, W. L.; O'Donel, H. V.; Shebbeare, E. O. (1919). "A tentative list of the vertebrates of the Jalpaiguri District, Bengal". Journal of the Bombay Natural History Society. 26 (4): 819–825. Israel, S.; Sinclair, T., eds. (2001). Indian Wildlife. Discovery Channel and APA Publications. ISBN 978-981-234-555-4. Khajuria, H. (1956). "A New Langur (Primates: Colobidae) from Goalpara District, Assam". Annals and Magazine of Natural History. 9 (98): 86–88. doi:10.1080/00222935608655728. Khajuria, H. (1978). "The golden langur, Presbytis geei Khajuria: Its discovery, authorship, taxonomic status, and bibliography". Primates. 19: 237–324. doi:10.1007/BF02373243. Medhi, R.; Chetry, D.; Bhattacharjee, P. C.; Patiri, B. N. (2004). "Status of Trachypithecus geei in a rubber plantation in Western Assam, India". International Journal of Primatology. 25 (6): 1331. doi:10.1023/B:IJOP.0000043965.38722.63. Mukherjee, R. P.; Saha, S. S. (1974). "The golden langurs (Presbytis geei Khajuria, 1956) of Assam". Primates. 15 (4): 327. doi:10.1007/BF01791670. Pemberton, R. B. (1838). Report on Bootan Indian Studies Past and Present. Calcutta: G. G. Huttman, Bengal Military Orphan Press. Prater, S. H. (1971). The book of Indian Animals. Mumbai: Bombay Natural History Society and Oxford University Press. p. 324. ISBN 978-0-19-562169-3. Srivastava, A.; Biswas, J.; Das, J.; Bujarbarua, P. (2001). 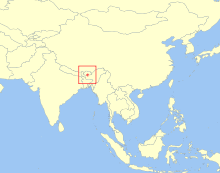 "Status and distribution of golden langurs (Trachypithecus geei) in Assam, India". American Journal of Primatology. 55 (1): 15–23. doi:10.1002/ajp.1035. PMID 11536313. Srivastava, Arun (2006). "Ecology and conservation of the golden langur, Trachypithecus geei, in Assam, India" (PDF). Primate Conservation. 21 (21): 163–170. doi:10.1896/0898-6207.21.1.163. Archived from the original (PDF) on 6 February 2012. Wangchuk, T.; Inouye, D. W.; Hare, M. P. (2003). "A new subspecies of golden langur (Trachypithecus geei) from Bhutan". Folia Primatologica. 74 (2): 104. doi:10.1159/000070007. Wangchuk, T.; Inouye, D. W.; Hare, M. P. (2008). "The emergence of an endangered species: evolution and phylogeny of the Trachypithecus geei of Bhutan". International Journal of Primatology. 29 (3): 565–582. doi:10.1007/s10764-008-9258-5. Wikimedia Commons has media related to Trachypithecus geei.